Another Monday, another sketch from MJ at TechnoStamper. This weeks sketch is one that works well with many stamps. I decided to showcase one of the new July Releases from Kitchen Sink Stamps called Multi Step Berries, the berries look so realistic IRL! To begin, I stamped the vine #2 in Olive, #1 Olive stamped off. The leaves #2 Olive, #1 Olive stamped off, #3 Olive. 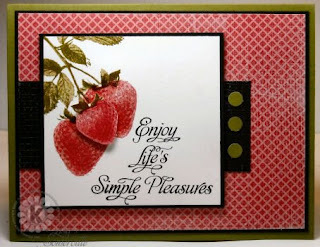 To stamp the berries I started the follow image #3 in Red, #2 in Red stamped off, #1 in Red stamped off, #4 in Red. The tops of the berries were stamped #2 Olive, #1 Olive stamped off, #3 Olive. The smaller berry was stamped the same way, cut out, then popped up on a dimensional. I used a SAMJ and black in to stamp the sentiment. To soften up the DSP and the Black panel, I used the Painted Mesh Technique from a past TJNL issue. Don't forget you can save 10% on all your Kitchen Sink Stamp purchases by using code LISA10KSS at checkout. Click here for the I want the Full Sink special (limited time offer). Beautiful card Lisa! Perfect DP to match your strawberries! Love the one berry popping off the page! Awesome! Your killing me with these stamps, they are so cool looking. I love these strawberries. Great card. Thanks for playing along.